The first time I tasted Amti I thought that the flavour was just divine. Today I make many variations of Amti at home as this spicy, sweet and sour lentils is enjoyed by all in the family. This version uses tomatoes, lime, chilies, and jaggery for the seasoning. A good garnish of cilantro and its bursting with flavour. Pressure cook the lentils in 2 cups of water with the turmeric until soft and mushy. Let the pressure drop completely before opening the cooker. Heat oil in a pan, add the mustard seeds, then the cumin seeds and hing. Next add the curry leaves and green chilies. Fry for a minute. Add this to the cooked lentils and boil. If the lentils are too thick, add a cup of water at this point. Next add the tomatoes. Cook until the tomatoes are mushy. Now add the jaggery and salt. Turn off the heat, add the lime juice. Serve hot garnished with cilantro. 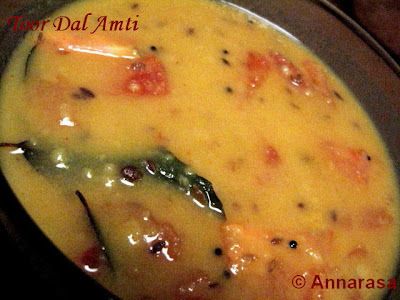 Amti tastes best with Basmati rice and any plain vegetables like potatoes, Moth Bhaji, or beans. Pulses are probably one of the most nutritious and healthy components of the vegetarian diet. They provide protein, almost 25% by weight and combined with grains they are said to provide a wholesome diet. With this in mind, I am sending this heart healthy recipe to Umm Mymoonah @ Taste of Pearl City. She is hosting Eat Well Live Well: Heart Friendly Recipes until 30th November at her blog.